A pressure transducer, often called a pressure transmitter, is a sensor that converts pressure into an analog electrical signal. Although there are various types of pressure transducers, one of the most common is the strain-gage base transducer. 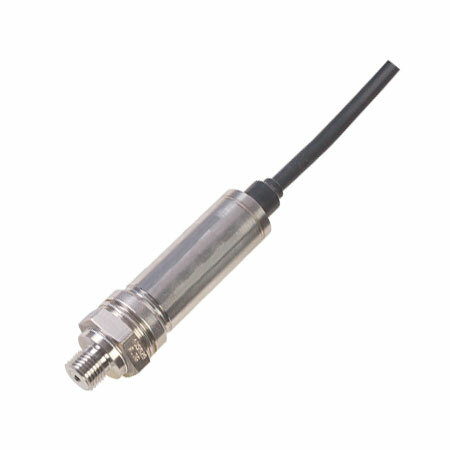 Heavy Duty/Industrial digital pressure sensors feature a much more rugged enclosure than other transducers. They are designed to accommodate heavy industrial environments. They also often feature a scalable 4-20mA output that provides much greater immunity to electrical noise which is not uncommon in industrial environments. Still wondering how to decide what type of pressure transducer or pressure transmitter you need? Our interactive pressure sensor selection tool will take you through all of the requirements for your application and provide a part number and price for the correct transducer. The pressure transducer housing should be selected to meet both the electrical area classification and the corrosion requirements of the particular installation. The corrosion requirements of the installation are met by selecting corrosion-resistant materials, coatings, and by the use of chemical seals, which are discussed later in this chapter. If the installation is in an area where explosive vapors may be present, the transducer or transmitter and its power supply must be suitable for these environments. This is usually achieved either by placing them inside purged or explosion-proof housings, or by using intrinsically safe designs. Probably the single most important decision in selecting a pressure transducer is the range. One must keep in mind two conflicting considerations: the instrument's accuracy and its protection from overpressure. From an accuracy point of view, the range of a transmitter should be low (normal operating pressure at around the middle of the range), so that error, usually a percentage of full scale, is minimized. On the other hand, one must always consider the consequences of overpressure damage due to operating errors, faulty design (waterhammer), or failure to isolate the instrument during pressure-testing and start-up. Therefore, it is important to specify not only the required range, but also the amount of overpressure protection needed. Most pressure transducers are provided with overpressure protection of 50% to 200% of range (Figure 3-12). These protectors satisfy the majority of applications. 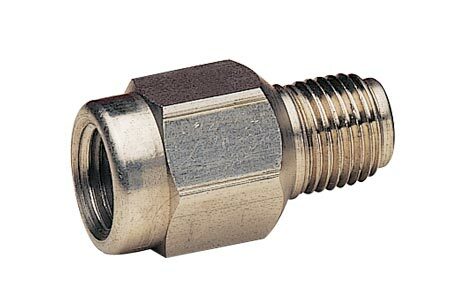 Where higher overpressures are expected and their nature is temporary (pressure spikes of short duration--seconds or less), snubbers can be installed (as the one in the image). These filter out spikes, but cause the measurement to be less responsive. If excessive overpressure is expected to be of longer duration, one can protect the sensor by installing a pressure relief valve. However, this will result in a loss of measurement when the relief valve is open. If the transmitter is to operate under high ambient temperatures, the housing can be cooled electrically (Peltier effect) or by water, or it can be relocated in an air-conditioned area. When freezing temperatures are expected, resistance heating or steam tracing should be used in combination with thermal insulation. When high process temperatures are present, one can consider the use of various methods of isolating the pressure sensor from the process. These include loop seals, siphons, chemical seals with capillary tubing for remote mounting, and purging.